Dilophosaurus was depicted in the movies as having a frill (similar to a frilled lizard that could extend around its neck), and was also shown as a venomous spitter. While this made for fascinating movie scenes, there is no evidence that the real Dilophosaurus had a frill, nor that venom glands existed. 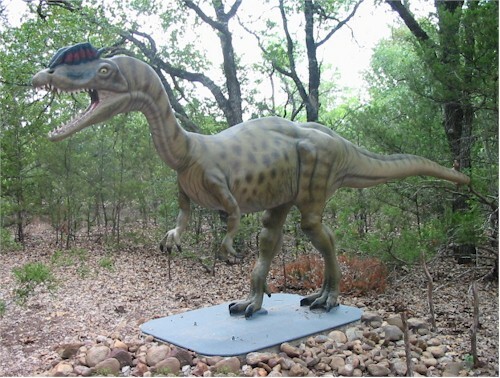 Dilophosaurus was a speedy, slender, meat-eater that lived during the early Jurassic period. Dilophosaurus was bipedal (walked on two legs). It had two thin, bony, almost semi-circular crests on its head; these may have been for mating displays. It had short arms with three-fingered hands and strong legs with four-toed feet (one toe was a dewclaw). Both fingers and toes had claws. It had hollow bones and an S-shaped, curved neck. Dilophosaurus had loosely attached jaws, which would have made killing animals with its teeth difficult. It must have killed with its clawed arms and legs, and/or scavenged carcasses.